The best items offered here in Manipal are undisputedly the bikes and scooters. Since young, my mom would tell me that riding was a dangerous activity. Living in the fast- paced city of Kuala Lumpur, I don’t blame her for preventing me from riding any two wheeled vehicle. Hence I never knew how to ride a scooter nor sat on a motorcycle before. However, being in Manipal changed that. Motorcycles were a craze for us Malaysian students. Like me, many never rode one before back in Malaysia and the motorcycles there are not as great as the ones we have in Manipal. The ones in Malaysia are smaller and they’re all in typical metallic colours – black or brown. This should spell out ‘ boring’ in the back of your minds by now. I must say, Manipal boasts a luxurious range of motorcycle models with every colour you could ever imagine. My guy friends would stare and compare bikes as they passed. Bikes were also one of the main topics we would always talk about and never get bored of it. I had taken a few pictures of the colourful Vespas, scooters and various models of motorcycles here and show it off to my friends back in Malaysia before. The guys were obviously green with envy. Why, there are even vespas painted in distinctive LV and Burberry designs! And not to mention the majestic Yamaha R15 that was every boy’s dream bike. There are also bikes with designs of fire, skulls, all painted with different shades of colour. Someone in my class had bought a bike and soon, everybody started buying their own. And that was also the first time I went on it. It was on one faithful night, my friend took me for a fast zoom along the road at Tiger circle. In the dead of the night, there were fewer cars and the night wind chilled me right to my bones. I loved the thrill. I loved the wind gushing through my hair. I love the distinctive sound of the exhaust pipe. Ever since then, I would beg my friends to take me for rides around in Manipal. It was always a thrilling experience for me. Then, after moving out from the hostel, I decided to get a scooter. Problem was, I had never ridden a scooter before this. The last time I rode a bicycle was when I was 8 years old ! It’s been such a long time since I tried balancing on two wheels. 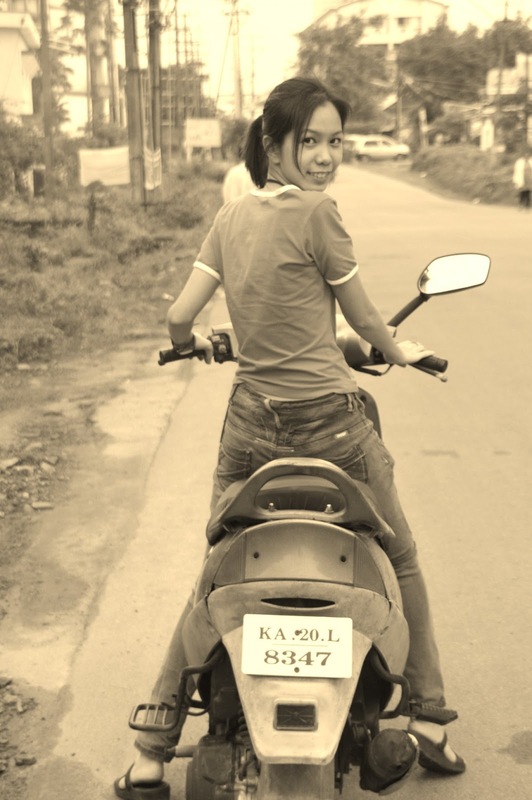 Nevertheless, I bought a scooter from a mechanic ( and got ripped off pretty badly…) and decided to learn to ride. Fear gripped my heart when I first got on the scooter. I didn’t even know how to start it. Sitting there feeling ashamed, my friend taught me how to start, to balance and lastly, accelerate. The moment I accelerated, the scooter darted forwards and my heart nearly leaped out from my throat. I tried riding around my apartment a few times (with both legs down on the ground..)and felt a surge of pride well inside me. I could finally ride a scooter! Night after night, my friends and I would ride around the serene town of Manipal, enjoying the night breeze and the thrill our scooters and bikes brought us. Our mini convoy always ended with smiles plastered on our faces. Soon, I was getting better and better until…when I had turned in at the junction of Kirthi Samrat, I suddenly rammed the breaks and skidded on the sand. I fell but I managed to escape with only a few minor bruises on my legs. After that, riding became an arduous task for me. I was afraid to fall again. Despite my fear, I have this infrangible strength inside me and I was determined to master the skill of riding, and thus, after my recovery, I started riding around again. Two years passed since I first rode my scooter. My scooter was more than just a scooter. He was my faithful companion and took me everywhere I needed to go. He was my freedom. I could go anywhere, making many stops along the way without the need of paying so much like how I have to when I travelled using an auto. Gone were the days whereby I had to negotiate the price with auto drivers or getting yelled at by impatient auto drivers who waited for me while I do my grocery shopping. Riding a scooter became a fun yet fulfilling experience for me. Sometimes when I was down in the dumps, I would take my scooter out and ride around Manipal and let the wind blow away my despair. Now that I’m leaving, I finally sold my scooter to a junior. On the day that I had to pass my scooter to her, my heart sank. I felt like I just left someone dear to me behind. I can remember every detail about him. The saccharine blue, the accelerator my hands fondly gripped on, the breaks that saved my life countless times… I walked away from it, feeling rather helpless and with a tug at my heart strings. To those who have bikes or scooters, savour every moment you have with it. You never know when you’re gonna haveto give it up, and you will never know how much you miss it, until you finally don’t own it anymore.